If you do the research you will soon discover, the “ONLY” patients who are overcoming Parkinson’s disease are the patients who are putting in their own effort at home, to complement the work done by their natural practitioners. — Keep in mind however, diet, exercise, acupuncture, supplements & normal chiropractic adjustments & massage are nowhere near effective enough to give patients long-term remission, specially if symptoms have been established for longer than 2 years. Normal Chiropractic Usually Does Not Give Any Long-term Improvement. In recent times (from April 2018) I discovered, “IT IS IMPERATIVE” that the spine is monitored & put back in alignment regularly, but if you use the normal chiropractic approach with a chiropractic visit every day, after 4 days or so, it will cause pain & possibly even nerve damage. — This is why I had to come up with a new way to do chiropractic adjustments on patients diagnosed with Rigidity Autoimmune Disorders, which did not cause that soreness or nerve damage. Parkinson’s Disease Is A Chiropractic Disorder, Not A Medical Disease & In My Opinion, That Is Why The Medical Profession Cannot Come Up With A Cure! The only patients who reach remission over Parkinson’s symptoms are the ones who have “ALL” their stress-provoked hormonal, nerve, muscular-skeletal abnormalities corrected, & the “ONLY” way to do this is to find a chiropractor who works side-by-side with a B.A.10 Natural Autoimmune Practitioner. Ask Any PD, MS, MSA, COPD, Patient If Chiropractic Helped Give Them Long-term Improvement & They Will “ALL” Answer “NO”, As Normal Chiropractic Is Ineffective. Many PD, MS, COPD patients become disappointed when they have repeated chiropractic adjustments without feeling any real long-term success. — There are many reasons for this disappointment and unless you find and correct those many reasons, you will not achieve any significant degree of remission. Read the explanation on how my B.A.10 Treatment works & you will understand why I achieve such quick significant success. — I use a more effective form of chiropractic &, a nerve massage that is “FAR” more effective in eliminating PD, MS, COPD type symptoms. There Is No Medical Test To Show That A Person Has Parkinson’s Disease, Because The Associated Symptoms Are “NOT” Caused By “A DISEASE” They Are Caused By Muscular-skeletal-nerve Abnormalities Which “CAN” Be Corrected. If a medical doctor or neurologist told you, because an MRI revealed that you have lesions on your brain or spinal cord, you have an incurable disease called “Parkinson’s disease” and your only option is a lifetime of pharmaceutical drugs, that won’t really help you, YOU NEED TO DO YOUR OWN INVESTIGATIONS because this is simply not true. 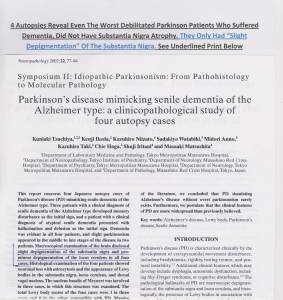 The reason I can say this is because several medical research teams in a number of countries have published research documentations that have revealed how lesions have absolutely “NOTHING” to do with the cause of the symptoms of Parkinson’s disease, but unfortunately these findings are being overlooked, the same as Dr. James Parkinson’s autopsy findings were overlooked way back in 1817. Listen To Patient MRI Results & Testimonies That Reveal, Lesions & Low Dopamine Levels Have Absolutely “NOTHING” To Do With The Cause Of PD, MS, COPD Type Symptoms. This next video is of interviews with Parkinson and MS patients who were given an MRI or a DaTscan test, so their neurologists could see if they had lesions or low dopamine levels even though it has been proven that lesions and low dopamine have nothing to do with the cause of Parkinson’s disease or MS.
MY INFORMATION IS “NOT” GUESSWORK, as I have done many years of research looking through hundreds of medical journals, reading many medical books & attending hospice training workshops at Brisbane’s Mount Olivet Hospital, supervised by Margaret Zwick. THE PRIMARY CAUSE FOR SYMPTOMS OF PARKINSON’S DISEASE: – My findings are that (1) Ongoing stress causes excessive amounts of the muscle rigidity hormone “Noradrenaline” to be released from the Pons (Locus Coeruleus) at the top of the neck (in the brain stem), due to neck problems starting with a C1 subluxation causing brain stem swelling, which is why “ALL” rigidity patients have a sore neck. (2) Encouraging a poor posture to exist for many years, due to bad habits in a career & (3) A physical accident injuring the spine, are the main reasons for undue pressure being placed on the spinal cord or nerves exiting the spine, to stimulate the development of Parkinson’s type symptoms. The tests that medical doctors and neurologists are trained by drug company lecturers at medical school to use, to diagnose Parkinson’s disease and MS, have such little to do with the cause of these disorders, that they “OFTEN” can’t make up their minds about what disease to label their patients with. The 3 Medical Journals Below “ALSO” Give “PROOF” That What Doctors and Neurologists Are Telling Newly Diagnosed Parkinson Patients, Is The Cause Of Their Symptoms, Is Bunkum. Substantia Nigra Is Not To Blame For PD! In My Next Video Of “Ross” You Will See How His Stress Caused Unique Muscle Swelling That Pulled His Spine Off-center To Cause His Symptoms. 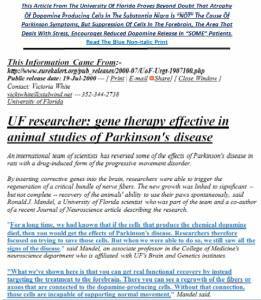 The ideals I use in this specialized treatment to overcome Parkinson’s Disease, MS and several other autoimmune disorders, also work well as a lifestyle course to promote longevity and good health in mature years. — If you have me treat you, the ideals you will learn can help you enjoy good health for the rest of your life. While massaging Parkinson patient “Ross Collins” and talking to him at the same time, about the enormous stress he suffered prior to his first symptom developing, I actually watched his back muscles become extra tense on one side of his spine, while the muscles on the other side of his spine, began relaxing to such an extent that it changed the alignment of his skeletal frame. — His twisted pelvis, became twisted in the opposite direction and one misaligned vertebra (C3) went back into alignment while others came out of alignment. — This event was the most outstanding psychosomatic event I had ever seen. — It was a true reflection of how emotional stress actually causes uneven excessive muscle tensions in spinal supportive muscles, which in turn, cause skeletal abnormalities that provoke the onset of the symptoms of Parkinson’s disease. — To actually be monitoring this patient while massaging him, and counseling him over the stress that originally caused his Parkinson symptoms, at the same time, was an incredible observation opportunity. Many Natural Stress Signs Of The Body, Used For Centuries, By Medical Doctors and Natural Practitioners, Have Been Left Behind and Long-forgotten. This next video may be the most informative of my videos for patients “and practitioners” to watch, as I have included in it, several body stress signs that indicated how Ross had problems with his kidneys, stomach and small intestine, problems that I find, many Parkinson and MS patients have. — These are very helpful natural stress signs of the body that I learner from my family medical doctor as a youngster, which have been left behind and long-forgotten by medical doctors of our day, as well as the vast majority of natural practitioners. — The true art of healing, seems to have been left behind and exchanged for an ill-health production line that, in my opinion, focuses far too much on product sales and not enough on people. SYMPTOMS: – Hips seizing when trying to turn. – Loss of balance. – Great difficulty walking. – Slight tremor. – Neck, shoulder and low back pains. – Bladder incontinence. 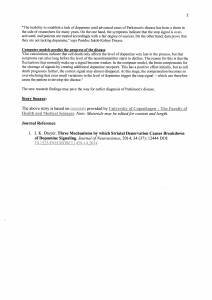 – Muscle spasms in the full body. The “REAL” Cause Of Parkinson’s Disease Is Excess Neck and Shoulder Tension, Abnormalities In The Cervical Spine, C1 Vertebral Hyper-mobility, A Thoracic Curvature, Poor Digestion and Absorption Of Nutrient, and Thickened Toxic Blood. If you watch any advanced Parkinson’s patient try to move around, the first thing you will notice is a severe stiffness in the whole body causing a slow robotic movement. — This stiff robotic movement is “NOT” caused by inadequate dopamine, it is caused by an excessive release of the muscle stiffness emotional stress hormone “noradrenaline” from the brain stem, combined with a buildup of toxins and waste in the blood which also provokes muscle stiffness. Most Parkinson Patients Have Thickened Toxic Blood Contributing To Muscle Stiffness. If you ask the average Parkinson patient if they have a sore neck, they will “ALL” answer “YES” because this muscle stiffness pulls on the cervical spine to cause the C1 vertebra to repeatedly come out of alignment (hyper-mobility), and until all these causal problems listed above are overcome, including blood cleansing, symptoms will not go away long-term. — All this however, is only the very beginning of a successful treatment. — Many patients I have treated, had thickened toxic blood and until I supervised them on a blood cleansing diet, to make sure their blood pressure remained healthy towards the end of their diet, their stiffness, C1 hyper-mobility and symptoms simply would not go away. 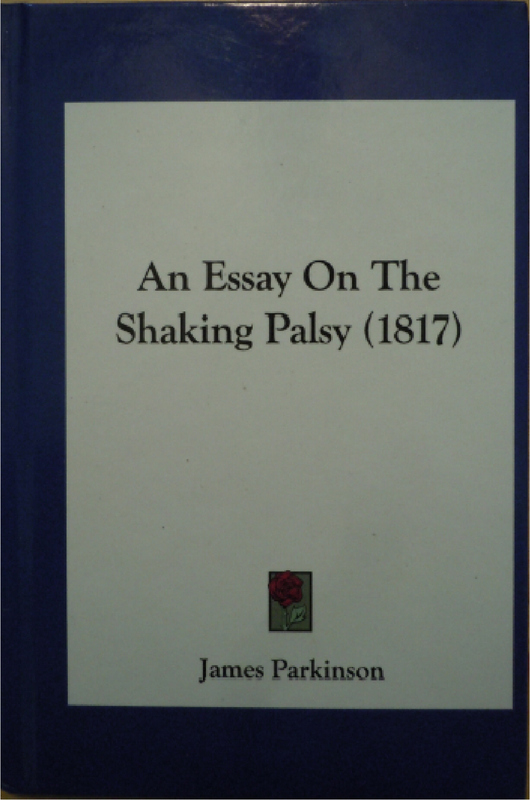 In the history of Parkinson’s disease, the stiffness associated with advanced patients has been so well connected to the symptoms of Parkinson’s disease that whilst Dr. James Parkinson himself called this disease “The Shaking Palsy” back in the early 1800’s, he and other prominent medical people, often used terms like “rigidity disorder” and “robotic syndrome” to describe it. Whilst their reference to stiffness does not indicate it is a cause, the quick significant improvement and remissions I have obtained, often in only 4 to 14 days, by overcoming this stiffness and the spinal curvature and C1 misalignments it causes, “is” proof that it “IS” a cause. It Is Essential For Your Therapist To Check Your Spinal Supportive Muscles and Your Spine, and Don’t Allow “ANYBODY” To Tell You, Spinal Curvature Cannot Be Overcome Because I Have Overcome It Repeatedly! — This Success Requires A Unique approach! If you have had your symptoms for longer than 2 years and you are being treated by a natural practitioner of any kind, and that practitioner is not familiar with spinal problems common to Parkinson’s disease, which can be seen in X-rays, that practitioner will not be able to help you. — It is essential that you have your spine inspected for curvature and other abnormalities, through X-ray examination, and, if you have swollen ankles, you must go on a “supervised” blood cleansing diet if you wish to obtain significant “long-term” improvement. My treatment is getting quick significant success because I am overcoming “ALL” the “primary” causal problems, as well as the additional secondary problems including the stress and anxiety that provoke them. 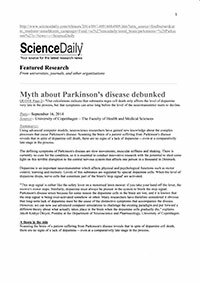 What Does Common Sense Say About The Medical Explanation Of Parkinson’s Disease? If Parkinson’s Symptoms Were Caused By Dopamine Cells Dying, Isn’t It Common Sense That For Symptoms To Often Vary Dramatically, Those Cells Would Have To Regularly Come Back To Life, Then Die again, Then Come Back To Life and so on? Is it not just common sense, that if Parkinson symptoms developed because dopamine producing cells in the substantia nigra had died and were subsequently no longer producing dopamine, all Parkinson patients would not experience “ANY” variation in symptom severity, yet they do. — Some Parkinson patients experience extreme variation in symptom severity even from a short afternoon nap. — In this explanation, symptom severity would have to remain constant, because dead cells have no option other than to remain dead. — They can’t die, then come back to life, then die again etc, according to the extreme symptom variations that some patients experience. — Once something is dead, it is dead! My List Of Required X-rays. Meet Me In South Carolina and Start Improving After Only 2 Days. I currently have 3 trips organised (February/March – May and August) to the US in 2018. — I will come to your home and treat you, checking your living environment as part of your treatment, or you can meet me in South Carolina at the end of February to join in a group workshop and 8 days of treatment for only $1.500-00USD. — Only 3 vacancies available. CONTACT ME NOW TO BOOK YOUR ATTENDANCE and ASK ME TO SEND YOU MY CAUSAL RECIPE QUESTIONNAIRE!